Trying to get on the WiFi network after forgetting your WiFi password. A few weeks ago on Yahoo Answers I saw a question on what to do if you lost your WiFi password? After answering the question, I gave it more thought and had a few more ideas. I then decided to write a more detailed answer here. This post will answer the initial question and provide a few workarounds and tips if you lose your WiFi password. The SSID (Service Set Identifier) is the name you see when you are accessing WiFi networks. 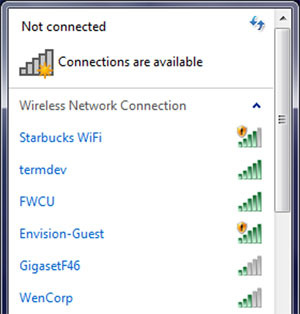 Here's a screenshot of the WiFi networks I saw when I was recently working at Starbucks. If you have access to the WiFi router you can login and get the password. You can also login and change your password to something new. Remember, if you change the password then everyone else that uses the router will also need to change it. Please note, steps 4 to 7 are for my router and the steps for your router may be different. If these steps don't work, a good idea to consult the user guide for your WiFi router. If you changed the WiFi password and you can't remember it, a factory reset will restore the original settings in the router. This will also erase any other settings in the router. So think about this before you do a factory reset. If you have an older router, the SSID will probably be the name of the router and there will be no password. This isn't a very good security mechanism and newer routers have a unique SSID and preset password. This is usually written on a label on the outside of the router or in the user guide. Don't do a factory reset unless you know the default user name and password of the router. The default credentials will be in your documentation. If you no longer have the printed guide or CD check the manufacturer's site. The usual router default settings are username = admin, password = admin. Once you can login, you can setup configure the SSID and password. I'm not going to go into the security aspects, but it's a good idea to change the SSID and password from the default. This is one difference when working from home or telecommuting. You don't have an IT team to bail you out. You have to be the IT guy. It's a very good idea to make a strong password that can't be hacked. This is not only a good idea for your WiFi passwords, but all of your passwords. Of course the problem with a strong password is that it's hard to remember. Here's a good article by Microsoft on how to create good passwords, click here to read the article. Once you have the WiFi password make sure you write it down and store it where it's secret and safe.